The G4V transforms the standard DJ controller into a dynamic performance controller. 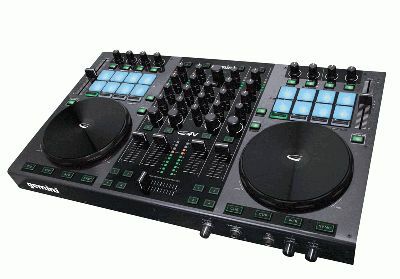 Within its fully metal enclosure the G4V provides 2 full-featured physical DJ decks, touch-sensitive jog wheels, 4 channels of audio with 3-band EQ and filter controls, and 16 multi-function performance pads and rotary encoders, the G4V delivers the sought after controls for spontaneous and intuitive track playback and manipulation. Standard DJ tools including pitch fader, key-lock, cue controls with hot cues, are augmented by advanced sampling controls, on-the-fly loop move, auto loop and loop roll modes. The 4-channel mixer gives you constant access to the Gain, EQ, and dedicated Filter controls on each software deck. A balanced XLR master output, master and booth RCA outputs, microphone and auxiliary inputs give you all that you could want in when it comes to I/Os. The pre-mapped FX controls for Virtual DJ bring immediate results upon first use, while the fully MIDI mappable and high-resolution 14-bit controls give the G4V the ability to easily be adapted for use with any of your favorite DJ applications. The multi-function performance pads and rotary encoders are detailed and responsive enough for a vast array of assignments and the vivid lighting of the performance pads, function buttons, and active LED level monitors give the visual feedback required in dimply lit envirements. With a professional 24-bit PC/MAC audio interface and all I/O’s needed to monitor, record and playback. Connect a microphone or an auxiliary source and the sound leaving the G4V is only limited by your imagination.